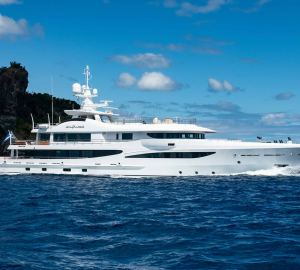 DRIFTWOOD is a 55.00m (180' 5") motor yacht built by the renowned Dutch shipyard AMELS, featuring naval architecture by Tim Heywood and bespoke interior design by Remi Tessier. She was launched in 2017 and boasts accommodation for up to twelve charter guests in five cabins, while serviced by a crew of thirteen. From the lower swim platform, guests have access to the tenders and the beach club, within which there is an exhaustive selection of water toys for all ages and levels of expertise. Two staircases connect to the main deck aft, where there is a sofa along the stern, an aft-facing sofa and a grand dining table and armchairs placed between. On the bridge deck, there is an elegant alfresco dining area beneath the sundeck hardtop. Corner sofas line the stern in addition to an armchair on both sides, and in the centre of each nearby coffee table, a fire pit will warm guests on chilly evenings. The foredeck is used to store the tender and motorised toys, and the forward mast can be used with a screen for an alfresco cinema from the sundeck. The sundeck boasts the best views on board and to the aft, there is a sofa/sunbed with a central headrest to allow guests forward and aft views. Beneath the hardtop, there is a large wet bar and an oval table with seating for six guests beneath the hardtop. Sofas line either side and the large oval Jacuzzi can seat multiple guests at once. Farther forward, guests can unwind on either of the double sunbeds with a canopy shade at the head. The custom interior by Remi Tessier features bleached teak Ivory Onyx and brushed Spruce with myriad spotlights in the ceiling to set off the beautiful textures and finishes in the materials. The lower deck hosts a beach club in the stern, within which there is a massive variety of water toys. The guest accommodation includes a massive forward Master suite with an office/lounge containing a Pullman berth, walk-in wardrobe, en-suite bathroom with tub, and a starboard side terrace beside the daybed. Two double cabins and two twin cabins (convertible to doubles and each containing a Pullman berth) can be combined to create two generous suites if required. On the main deck, the floor-to-ceiling windows and side terraces flood the interior with natural light and air for a more invigorating dining experience for up to 10 guests at the elegant and modern oval dining table. To the aft, the salon consists of the main seating area to port with two armchairs, a bench and a wall sofa around a coffee table, while to starboard there is an additional sofa with small drinks tables for resting beverages from the aft bar. The bridge deck places the helm station and Captain's cabin forward, with a spacious sky lounge behind the foyer. The sky lounge is furnished with a forward-facing curving sofa placed around a coffee table. The setting is mirrored in the aft port and starboard corners, allowing guests to spread out and enjoy separate conversations surrounded by large windows providing clear views of the location. A pair of MTU 16V 2000 M70 diesel engines producing 1,408 HP allows for a top speed of 15.5 knots and a cruising speed of 13 knots with a range of 4,500 nautical miles. Accommodation configuration includes five generous cabins including one full-beam master suite with an owner office and Pullman berth. The VIP suite can also be separated into two good-sized double cabins and in addition, there are two twin cabins convertible into doubles. 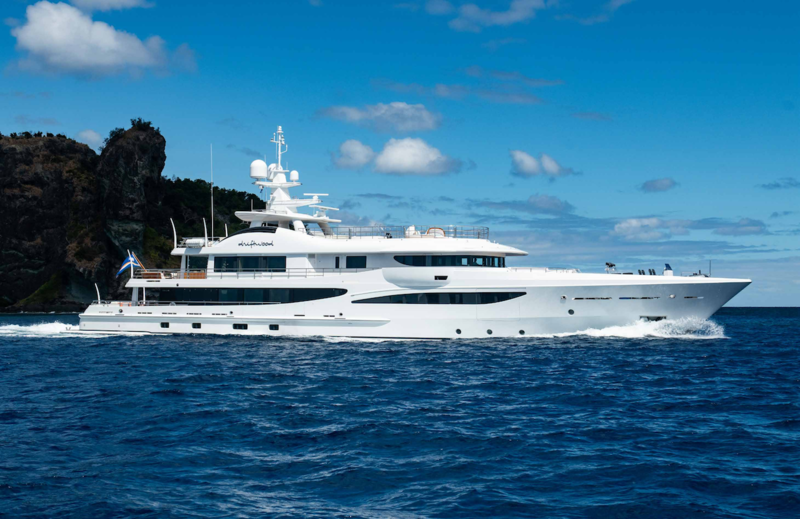 We do have available further amenity, owner and price information for the 55.00m (180' 5") yacht DRIFTWOOD, so please enquire for more information.